This paper investigates dynamic modeling, design and control strategy of a grid-connected photovoltaic (PV)/wind hybrid power system. The hybrid power system consists of PV station and wind farm that are integrated through main AC-bus to enhance the system performance. The Maximum Power Point Tracking (MPPT) technique is applied to both PV station and wind farm to extract the maximum power from hybrid power system during variation of the environmental conditions. The modeling and simulation of hybrid power system have been implemented using Matlab/Simulink software. The effectiveness of the MPPT technique and control strategy for the hybrid power system is evaluated during different environmental conditions such as the variations of solar irradiance and wind speed. The simulation results prove the effectiveness of the MPPT technique in extraction the maximum power from hybrid power system during variation of the environmental conditions. Moreover, the hybrid power system operates at unity power factor since the injected current to the electrical grid is in phase with the grid voltage. In addition, the control strategy successfully maintains the grid voltage constant irrespective of the variations of environmental conditions and the injected power from the hybrid power system. Fig. 1. The system configuration of PV/wind hybrid power system. (d) A derivative of power with respect to voltage (dPpv/dVpv). Fig. 2. Performance of PV array during the variation of solar irradiance. (b) d-q axis components of injected current from PV station. (c) Injected active and reactive power from PV station. (d) Grid voltage and injected current from PV station. (e) The power factor of the inverter. (f) Injected current from PV station. Fig. 3. Performance of PV station during variation of the solar irradiance. 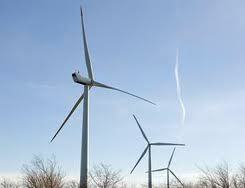 (b) The mechanical torque of wind turbine. (c) The DC-bus voltage of DFIG. (d) Injected active and reactive power from the wind farm. (e) The power factor of the wind farm. (f) Injected current from the wind farm. Fig. 4. Performance of wind farm during variation of the wind speed. (a) Power flow between PV station, wind farm, and hybrid power system. (b) Injected active and reactive power from the hybrid system. Fig. 5. Performance of hybrid power system at PCC-bus. In this paper, a detailed dynamic modeling, design and control strategy of a grid-connected PV/wind hybrid power system has been successfully investigated. The hybrid power system consists of PV station of 1MW rating and a wind farm of 9 MW rating that are integrated through main AC-bus to inject the generated power and enhance the system performance. The incremental conductance MPPT technique is applied for the PV station to extract the maximum power during variation of the solar irradiance. On the other hand, modified MPPT technique based on mechanical power measurement is implemented to capture the maximum power from wind farm during variation of the wind speed. The effectiveness of the MPPT techniques and control strategy for the hybrid power system is evaluated during different environmental conditions such as the variations of solar irradiance and wind speed. The simulation results have proven the validity of the MPPT techniques in extraction the maximum power from hybrid power system during variation of the environmental conditions. Moreover, the hybrid power system successfully operates at unity power factor since the injected reactive power from hybrid power system is equal to zero. Furthermore, the control strategy successfully maintains the grid voltage constant regardless of the variations of environmental conditions and the injected power from the hybrid power system. H. Laabidi and A. Mami, “Grid connected Wind-Photovoltaic hybrid system,” in 2015 5th International Youth Conference on Energy (IYCE), pp. 1-8,2015. A. B. Oskouei, M. R. Banaei, and M. Sabahi, “Hybrid PV/wind system with quinary asymmetric inverter without increasing DC-link number,” Ain Shams Engineering Journal, vol. 7, pp. 579-592, 2016. R. Benadli and A. Sellami, “Sliding mode control of a photovoltaic-wind hybrid system,” in 2014 International Conference on Electrical Sciences and Technologies in Maghreb (CISTEM), pp. 1-8, 2014. A. Parida and D. Chatterjee, “Cogeneration topology for wind energy conversion system using doubly-fed induction generator,” IET Power Electronics, vol. 9, pp. 1406-1415, 2016. B. Singh, S. K. Aggarwal, and T. C. Kandpal, “Performance of wind energy conversion system using a doubly fed induction generator for maximum power point tracking,” in Industry Applications Society Annual Meeting (IAS), 2010 IEEE, 2010, pp. 1-7. Innovative electrical projects Electrical and Electronics Engineering involves designing, controlling and maintaining the electrical equipments. Some of the project areas of electrical field are power generation, power system equipment maintenance and handling, industrial control and robotics, power electronics and energy systems. Conductors are made of atoms whose outer, or valence, electrons have relatively weak bonds to their nuclei, as shown in this fanciful image of a copper atom. When a bunch of metal atoms are together, they gladly share their outer electrons with each other, creating a “swarm” of electrons not associated with a particular nucleus. A very small electric force can make the electron swarm move. Copper, gold, silver, and aluminum are good conductors. So is saltwater. There are also poor conductors. Tungsten—a metal used for light bulb filaments—and carbon—in diamond form—are relatively poor conductors because their electrons are less prone to move. Insulators are materials whose outer electrons are tightly bound to their nuclei. Modest electric forces are not able to pull these electrons free. When an electric force is applied, the electron clouds around the atom stretch and deform in response to the force, but the electrons do not depart. Glass, plastic, stone, and air are insulators. Even for insulators, though, electric force can always be turned up high enough to rip electrons away—this is called breakdown. That’s what is happening to air molecules when you see a spark. Semiconductor materials fall between insulators and conductors. They usually act like insulators, but we can make them act like conductors under certain circumstances. The most well-known semiconductor material is Silicon (atomic number 141414). Our ability to finely control the insulating and conducting properties of silicon allows us to create modern marvels like computers and mobile phones. The atomic-level details of how semiconductor devices work are governed by the theories of quantum mechanics. This paper researches a novel pulse width modulation (PWM) conspire for two-stage interleaved support converter with voltage multiplier for energy component control framework by consolidating substituting stage move (APS) control and conventional interleaving PWM control. The APS control is utilized to lessen the voltage weight on switches in light load while the customary interleaving control is utilized to keep better execution in substantial load. The limit condition for swapping among APS and conventional interleaving PWM control is inferred. In light of the previously mentioned examination, a full power run control joining APS and conventional interleaving control is proposed. Misfortune breakdown examination is likewise given to investigate the productivity of the converter. At long last, it is confirmed by test results. Fig. 1. Grid-connected power system based on fuel cell. Fig. 2. Main theoretical waveforms at boundary condition. Fig.3 Experimental results at boundary condition with traditional interleaving control (L = 1158 μH, R = 2023 Ω, and D = 0.448). (a) CH1-S1 Driver Voltage, CH2 − L1 Current, CH3-S1 Voltage Stress, CH4-Output Voltage, (b) CH1-S1 Driver Voltage, CH2 − C1 Current, CH3-S1 Voltage Stress, CH4-OutputVoltage, (c) CH1-S1 DriverVoltage,CH2 − D1 Current,CH3-S1 Voltage Stress, CH4-Output Voltage, (d) CH1-S1 Driver Voltage, CH2 −DM1 Current, CH3-S1 Voltage Stress, CH4-Output Voltage. Fig. 5. Traditional interleaving control in Zone A (L = 1158 μH and R = 1658 Ω). The limit condition is determined after stage investigation in this paper. The limit condition arranges the working states into two zones, i.e., Zone An and Zone B. The conventional interleaving control is utilized in Zone A while APS control is utilized in Zone B. What’s more, the swapping capacity is accomplished by a rationale unit. With the proposed control plot, the converter can accomplish low voltage weight on switches in all power scope of the heap, which is confirmed by exploratory outcomes.